Welcome to the 2016 College Baseball Season! Despite there still being snow on the ground here, D1 programs all over the country played their first series this past weekend. I know; I’m one of the few guys out there (at least in DC blogger-land) covering the College game. So i’m ok if you keep moving on. I probably got really turned onto the College game as I started to really look at the college arms the Nats were drafting, and the focus the Mike Rizzo establishment puts on college players. Its a very “Billy Beane-esque” strategy; college players have more ABs, more consistent stats and more experience playing against “known quantities” of talent (especially those guys in the top baseball leagues like the SEC and ACC). Now with two very good local programs (UVA and UMD) and a ton of local guys who i’ve been following long enough to track them from HS draft prospect to College draft prospect, I continue coverage of the College game. 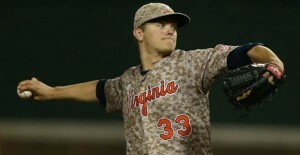 UVA’s Connor Jones threw 7 shut-out innings in a UVA win over Kent State. UVA’s Matt Thaiss went 6-13 in the kickoff tournament down in Myrtle Beach. Ole Miss’ Error Robinson (a dc-native but quickly rising on the draft boards) went 2-for-7 with 3 walks and 4 runs in a their opening series sweep against FIU. UNC’s J.B. Bukauskas had 9 Ks in 4 2/3’s innings but got a hook after showing some wildness in an eventual UNC loss. I have a comprehensive post about all DC-area prospects coming, headlined by these four guys but also including all the local prep and college players, which we’ll post once HS season starts up. Meanwhile, here’s some pre-season top-X lists for the new year: you’re going to see the same 4 teams at the top of every list. There’s only 5 or so main sites covering the game, so we’ll go back to these blogs and sites constantly. D1baseball.com and BaseballAmerica.com are the leaders but the other Collegiate Baseball sites are good as well. D1Baseball’s pre-season top 25: Florida, Louisville, TAMU, Vandy, Oregon State. Baseball America’s pre-season top-25: Florida, Louisville, TAMU then surprisingly UVA #4. College Baseball Daily pre-season top 25 from 2/1/16: Louisville #1, TAMU #2, Vanderbilt #3 and Florida #4. Virginia #8, Maryland #22. Collegiate Baseball News pre-season top-40 announced in Dec 2015. Florida #1, Louisville #2, which isn’t surprising since both teams have multiple pre-season first team all-americans on their team. Local teams mentioned: UVA #9, Maryland #28. NCBWA (National Collegiate Baseball Writers Association)’s pre-season top-30: Florida, Louisville, Vandy and TAMU. And here’s some pre-season All-America lists. You’ll recognize a lot of these names if you’ve followed any pre-2016 draft coverage, and this list will eventually comprise a huge percentage of the first round draft this coming June. Collegiate Baseball News announced in Dec 2015 their pre-season All Americans and it contains a whole slew of names in contention for 1-1 in 2016. A.J. Puk, Alec Hanson, Corey Ray along with other big-time names such as Kyle Funkhouser, Nick Banks. Maryland’s Mike Shawaryn is a 1st teamer, UVA’s Connor Jones and the Navy’s Luke Gillingham a 2nd-teamer, and Matt Thaiss (UVA), Charley Gould (W&M) and Michael Morman (Richmond) are 3rd teamers. D1Baseball.com’s pre-season all American list: the two aces for local college teams UVA and UMD are listed (Jones and Shawaryn). UVA’s Thaiss is a 2nd teamer. D1baseball also has a list of the Top 300 College draft prospects for 2016. BaseballAmerica’s pre-season All American team is here. No local guys on 1st team, Shawaryn, Jones and Pavin Smith are on the 2nd and 3rd teams. USA Baseball pre-season Golden Spikes watch list: includes most major D1 prospects and local guys Shawaryn, Jones, Thaiss and Gillingham. A full overview of D1Baseball’s coverage is here. BaseballAmerica’s College index is here. Subscribe to comments with RSS or TrackBack to 'College Baseball Kickoff – Opening Weekend review and some pre-season ranking lists'. OK, I’ll admit it, my main interest in the college ranks is in potential draft picks. I’ve lost track of how high the Nats’ comp pick has risen, but I think it is just short of 30. I’m still not sure whether they’re going to get the pick for Desi, all the more so after the ChiSox just signed Rollins. With two picks, I would think the Nats might be looking for a bat and an arm (perhaps a wounded college arm) in the late 20s. If it is just one pick, the “best player available” may be a pitcher, but the Nats really need hitters. The next generation of guys like Goodwin, Skole, Martinson, and Vettleson has not panned out. Any thoughts at this point what hitters might be available in that range? I haven’t looked at the draft prospect rankings in a few months. At the time, even before the Nats surrendered their 1st round pick, I wasn’t that impressed with the power potential even at the top of the draft. Most of the prospects struck me as more the Rendon types (although not THAT good in college), line-drive guys who might develop some power. I don’t think someone like Ray, Reed, or Banks would drop down that far to them, but you never know, particularly if 18-20 teams ahead of them take pitchers and a couple can’t resist flyers on high schoolers. Boy, the Desi thing is getting uncomfortable. 20 and has been putting out info. In the comments section, he posted a write up on Cole and Hearn. Both were positive and worth reading. Cole gets a Jake Odorizzi reference and Hearn is a sleeper pick for him. He is asking for feedback from readers too. So, as we speak, the Nats lost what would have been 1-16, having risen from 1-18. But (assuming Desmond signs elsewhere) our two comp picks would be 1-29 and 1-30, having both risen fully 9 spots. And depending on who signs Desmond and Fowler they may rise a couple more even. Who is available at 1-29 and 1-30? Impossible to say right now. I hear a whole slew of guys in the 1-1 conversation right now, meaning the top 10 will look really heavy. Wally: Got a link to the Sickels post you are referencing? I’m going to be very disappointed if the Nats don’t get the Desi pick. Not as disappointed as Rizzo, though! This is supposed to be one of the deeper drafts in a long time, which may have been part of the Nat reasoning for being willing to give up the pick for Murphy. But I’m sure they made that decision thinking that they had two comp picks coming. There’s a link to the “preliminary list” for Nats. That’s where Sickels solicits feedback. these are two of the big lists remaining before i do a big write up talking about the end of “prospect season” and a re-publishing of the big XLS tracking all this stuff. Thanks for the links. On quick glance, I see that MLB has Baez at #18, while Sickels doesn’t even have him on his board. MLB omits Andrew Lee. Neither list has Simms, despite his strong AFL performance, or Mejia, who is at least as good as some of the other Dominicans. MLB doesn’t have Watson, either, but blasts Perkins all the way up to #11. Some gaps are evident when looking at MLB, Keith Law and BA’s lists. – Law doesn’t rate Stevenson at all in his top 15; MLB has him #8, BA #14. – Law also doesn’t have Ward or Soto in his top 15 while the other two publications do. – Law has Reetz #8; the other two 13 and 17. Whether Simms is a “prospect” or not, he’s way closer to being a major-leaguer than a number of those guys are ever going to get. I wouldn’t have Soto listed yet, either; he hasn’t played. It’s very, very hard to judge anything early about the young ones. Many of the lists have Perkins pretty high, but he really struggled. Meanwhile, Watson dominated in the same league but barely gets mentioned. Ward and Reetz both really struggled last year as well. They were still teens, and Ward in particular was very young for Potomac. But at some point these guys will have to prove that they can actually make solid contact with a baseball.